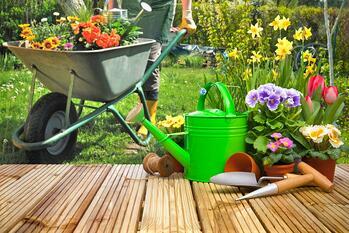 For many people, summer is the time of year when backyard maintenance is a top priority. Especially so when they are getting ready to put their home on the market. Before making any concrete plans, however, check out our list of dos and don'ts for your backyard improvement projects. Select plants that are indigenous to the area in which you live. This can be especially valuable in places like Utah that have little rain fall during the summer months. Whatever you decide to do with your yard should fit your lifestyle. If you don’t have time to take care of a full flower bed, don’t plant one. It’s better to have a basic yard that’s easy to maintain than try to have the best yard on the block and not being able to handle the upkeep. It’s easy to plan your yard for summer but it’s essential to take all four seasons into account when planning your yard. It’s also important to take a plant’s maturity into consideration. Yes, that little tree looks great now, but what about in 10 years when it’s fully grown, blocking the view from your window, and a hazard to your roof? Never plant or build anything based on looks alone. The average cost of installing an in-ground pool in Utah is about $22,000. However, this expense doesn’t necessarily mean you will add value to your home. Additionally, if not taken care of properly, a pool can be seen as a liability to a buyer. If you still want to install a pool, make sure you are 100% prepared to handle the responsibility, both personally and financially. While a lush, green lawn is great, a wild lawn can make your house look unkempt. If the lawn is becoming too much too handle, consider xeriscaping in some areas. Keep the lawn trimmed back properly so it’s not growing on top of sidewalks, patios, and driveways.